We don't have the money to mass produce shirts, especially if they won't sell. We wanted high quality but at a really low price. We found our answer in pre-orders. If a shirt does well we can make them, to order, through a stellar U.S.-based company that allows us to order the exact size, color, & number we need. If a shirt does poorly then no one is charged and we can go cry in our beds. You will not be charged until the order is ready to be fulfilled. After we've received 50 pre-orders on any given product we will create, produce, and ship the product. We do it this way so that we can keep costs low to our customers by keeping costs at a minimum on our end. We appreciate your support and patience... we're striving to bring more great gear, for the glory of God, into the world. The Prince didn't come to play around. With his nautically themed tat we celebrate the man who has made us fall in love with God more deeply every morning and evening. 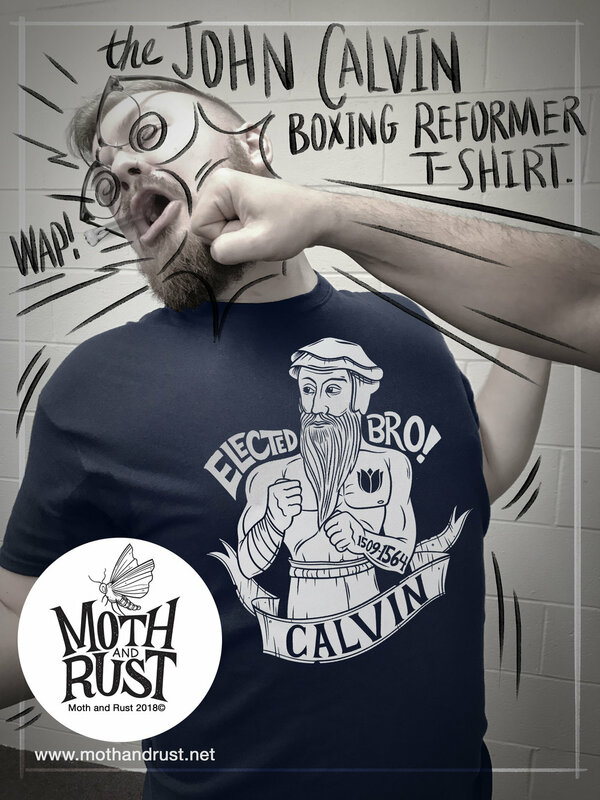 Few men have made as big of a theological impact as John Calvin and thanks to him we can confidently say... we we're predestined to make this dope t-shirt. Available in two colors: Charcoal and Midnight Blue. An homage to the man who, by grit and spiritual resolve, started the Reformation.